Chop the lard and butter and place in a bowl. Pour over boiling water (200 ml). Place the flour and salt in another bowl, make a well in the centre and put in it the two eggs. When the butter and lard has melted start mixing it into the flour / egg mixture. Eventually combine all the ingredients into a dough. Line your chosen dish using three quarters of the pastry. You can do this by rolling it out, though this can be difficult owing to the soft texture of the pastry, or mould it into the tin with your hands. Mince the meat or finely chop it, (I find it best to chop three quarters of the meat and mince the other quarter. Chop the sage leaves. Mix all the ingredients really well. 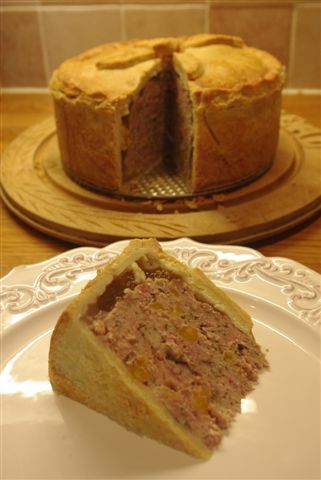 Pack the meat into the pie dish gently taking care not to damage or make a hole in the pastry. Roll out the reserved quarter of the pastry, wet the edges of the pastry in the tin and place the lid on the top. Trim the edges and crimp to seal and make a pattern. Cut a small round hole in the centre with a very small cutter, this lets the steam out and will later be useful for putting in the jelly. Egg wash the top and cook the pie at 190 C /gas mark 5 (180 C for fan assisted ovens) for 40 minutes then reduce the oven to 180 C / gas mark 4 (160 for fan assisted) for a further 50 – 65 minutes. Check with a skewer, through the hole in the centre that the meat is done. Remove from the oven and allow to cool. If you want to fill the spaces in the pie with jelly, make up ½ pint of chicken stock with boiling water and melt into it 2 leaves of gelatine. Pour through the centre hole while the pie is still warm. Chill in the refrigerator overnight.